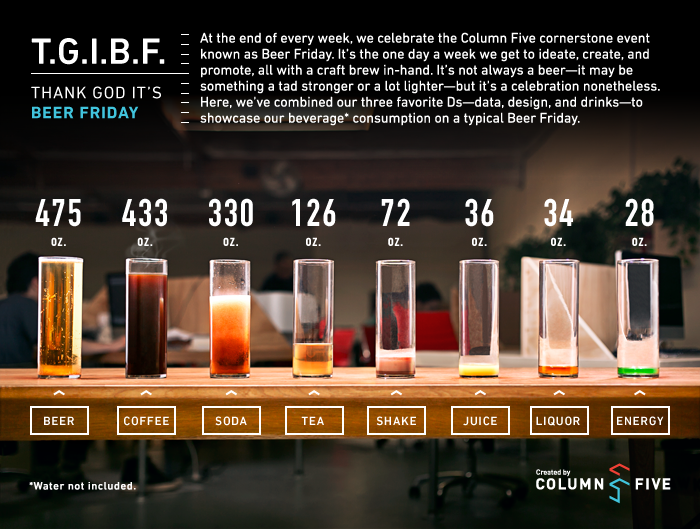 At Column Five, we celebrate Beer Friday every week. We’ve always wondered, though, exactly what—and how much—we actually drink each Friday, so we decided to find out. The following visualization is based on data collected from 45 Column Five employees, tracking all beverages consumed during work hours (with the exception of water) over the course of one Beer Friday. Ounces were tracked using the following general guidelines: beer (12 oz. ), soda (12 oz. ), coffee/tea (8 oz. ), hard liquor (1 oz. ), etc.